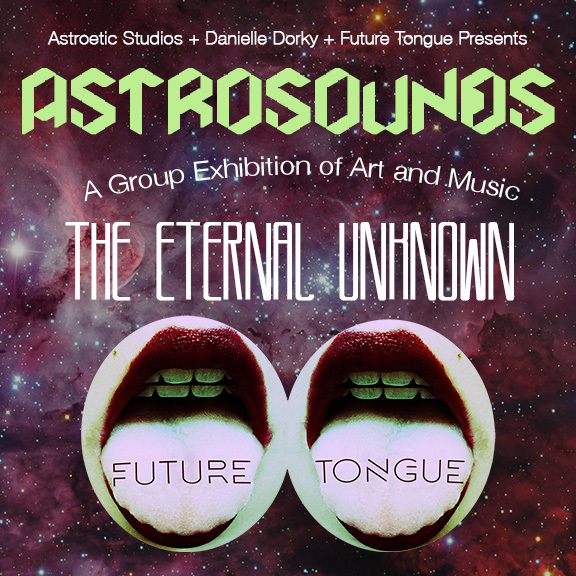 Future Tongue is teaming up with Astroetic Studios and Danielle Dorky to create an event entitled The Eternal Unknown that will celebrate visual art, live music and the creative string that runs between the two. Astrosounds is a monthly event thrown by Astroetic Studios during the Art Walk in Downtown, LA. We are featuring a live concert which will be followed by a live interview of the band and one artist selected from the open call. Future Tongue is seeking artists of all modalities to enter the show. Painting, photography, multi-media, performance, sculpture, print making and everything in between will be considered for admission in this group exhibit. We will be making this decision based off of technical skill and conceptual creativity. The studio is a beautiful loft in Downtown, Los Angeles. Here is a review of the a previous Astrosounds event written by Danielle Dorky. Future Tongue will be curating and selecting one artist to be live interviewed during the event. The interview will be recorded and will be shared for personal use. Future Tongue will also then do a studio visit and publish a more in depth interview with images, and video much like the others on our website. We are looking to expand our Future Tongue family and are excited to see and share your work! Deliver to Silverlake, Los Angeles. **Artists are responsible for delivery, pick up, or shipping of the work. The show will exhibit for one night only. Pick ups will begin Friday, January 15th or at the end of the event. An artist statement including your bio and any personal information about your practice as an artist. We will be looking at this information to as the basis of our interview selection along with the images of your work. If you do not wish to be considered for the live interview portion of the night, you are welcome to opt out. Just let us know upon your submittal.